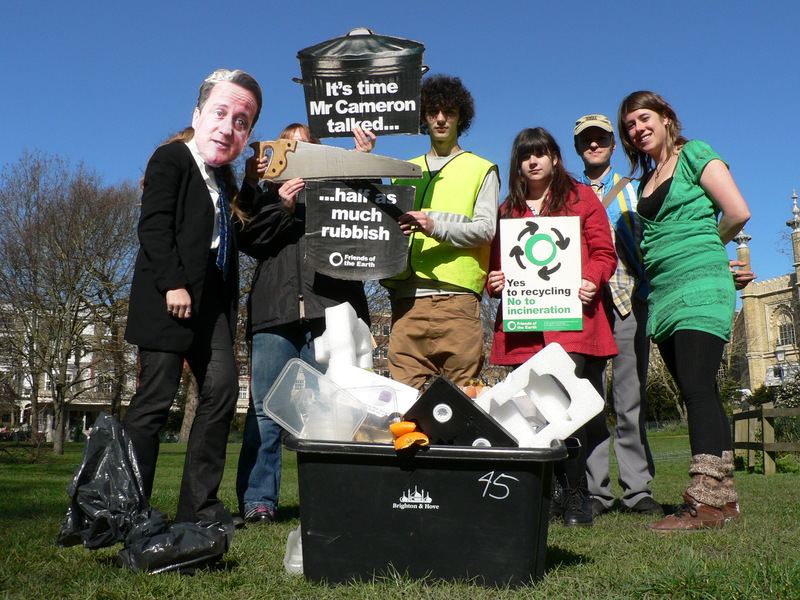 Brighton & Hove Friends of the Earth is urging Prime Minister David Cameron to cut rubbish and boost reuse and recycling. The Government is currently deciding what to do about the country’s rubbish and we want a goal to halve the rubbish that people have to put into their black bin bags. While Brighton & Hove runs the local rubbish and recycling collections, they need a boost from Westminster to be able to improve services and send less rubbish to be buried and burnt. Over 60% of what goes into black bags in the City could be composted or recycled. Brighton & Hove Friends of the Earth joined other groups around the country and took part in a day of action calling for a nationwide goal halving rubbish and boosting recycling and re-use. “People in the City are keen to get the rubbish out of their bins, we don’t want to dump it on Newhaven – and we’re all frustrated by having to throw away food waste, unnecessary packaging and the stuff that the council doesn’t recycle. Cities like Bristol collect food waste and do four times as much composting as Brighton. We want the Government set targets so we have to halve the rubbish that has to go into our black bin bags by 2020. Brighton & Hove currently only recycles 27% per cent of rubbish. Friends of the Earth wants Local Authorities to be able to recycle and re-use more of our household waste and for more products to be designed to be easy to re-use and recycle.